In the modern era, zoos and aquariums fight species extinction, educate communities, and advance learning of animal behaviour. This book features first person stories and scientific reviews to explore ground breaking projects run by these institutions. Large-scale conservation initiatives that benefit multiple species are detailed in the first section, including critical habitat protection, evidence-based techniques to grow animal populations and the design of community education projects. The second section documents how zoos use science to improve the health and welfare of animals in captivity and make difficult management decisions. The section on saving species includes personal tales of efforts to preserve wild populations through rehabilitation, captive breeding, reintroduction, and public outreach. 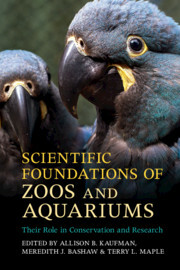 The concluding section details scientific discoveries about animals that would have been impossible without the support of zoos and aquariums. The book is for animal scientists, zoo professionals, educators and researchers worldwide, as well as students of zookeeping and conservation.